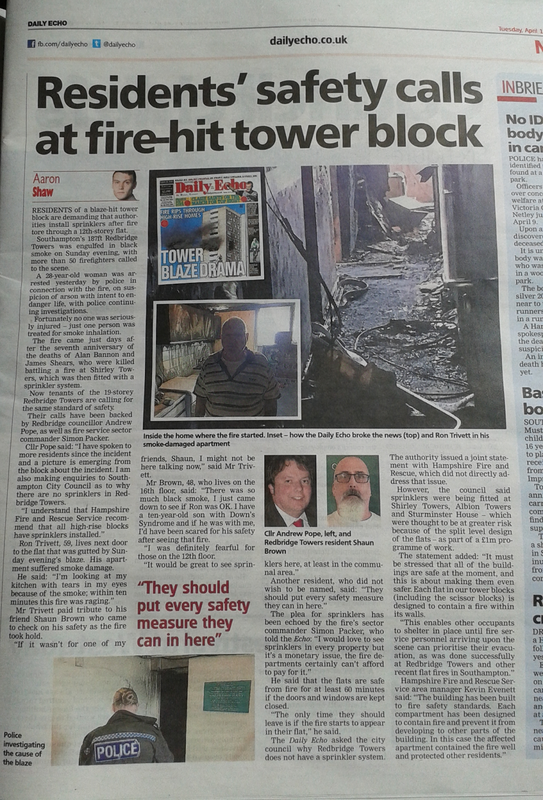 (15th June 2017): The latest article on Redbridge Towers, following the Grenfell Tower tragedy, is here. 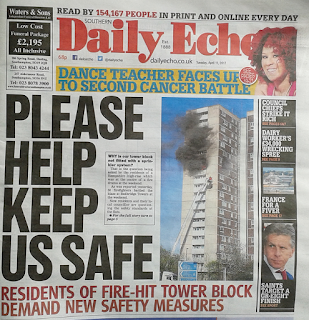 As reported in Tuesday's Daily Echo, we agree with residents that Redbridge Towers should have sprinklers. UPDATED (25th April 2017): Following further conversations with residents of Redbridge Towers, we have confirmed once again that they DO want sprinklers installed. On top of the below, Cllr Pope has told the Labour-run Council once again that they need to find the money for them to be installed. Residents are very angry that the Council has found the money for the "Arts", a community garden and fancy fencing that residents don't want - but not for sprinklers. And residents told Council officers this at the meeting on the proposed changes to Cuckmere Lane and Studland Close, confirmed by the Council as costing £1.675m. The Fire Service agreed with our campaign! 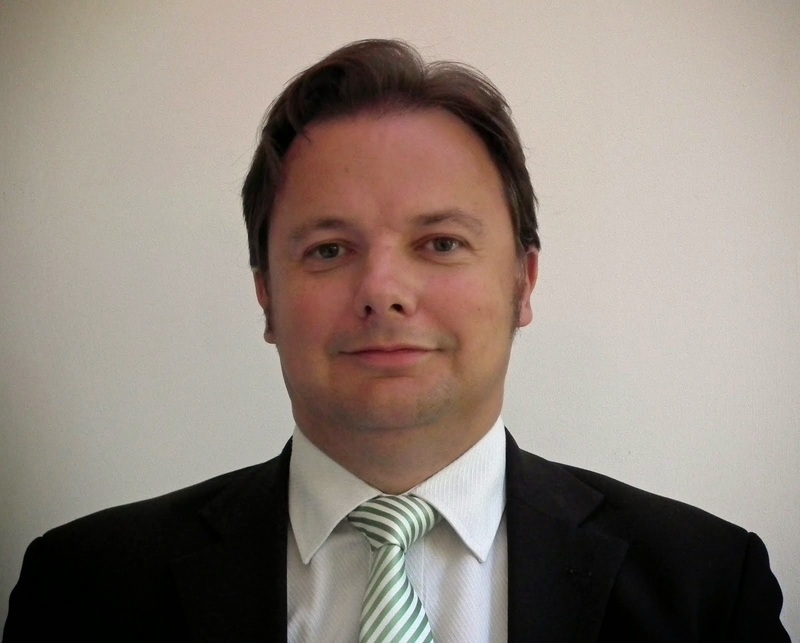 We have asked the person responsible for making the decision to NOT install them, Labour Councillor Warwick Payne, Cabinet Member for Housing, to answer questions on sprinklers. What do you think of Councillor Payne's answers? Do you agree that he should put the money into sprinklers, instead of spending money on an unwanted community garden and fancy metal fencing on Cuckmere Lane? That is what most residents told us they wanted today. And do you think his views are offensive to all those residents who have told us they want sprinklers? Have you even heard of the "Tenant Resource Group" that Councillor Payne seems to want to blame? Contact us on 07580 715 687 or on sotonindies [at] gmail.com or on our Facebook page Southampton Independents. Q1: Why did you, the Cabinet and the Leader decide not to fit sprinklers in all high-rise blocks in the City, following the Coroner's recommendation following the Shirley Towers incident? A: The coroner said landlords should be “encouraged to consider” fitting sprinklers, so it wasn’t a firm direction on his part, just a suggestion. 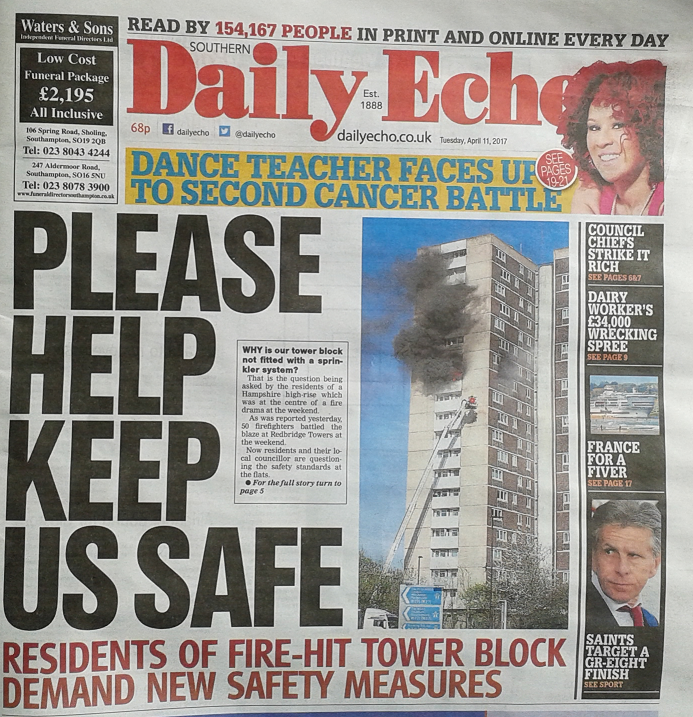 On the back of this, SCC housing chiefs and fire chiefs met to discuss the best way forward, and it was decided jointly that sprinklers would provide the greatest benefit in Shirley Towers and its sister blocks (Sturminster House and Albion Towers) due to their complex layout which makes firefighting more complicated, which is less of an issue at our other towers which have a simpler layout (for example, Redbridge Towers). Q2: Was this issue raised by OSMC (the Council's chief scrutiny committee which tries to hold the Labour-run Council to account) when it was considered by the Committee in early 2016? If it was, what was your response? A: Yes, and the response was identical to the above, which was accepted. Q3: What role did cost have in your decision? A: Extending the project where it would have much less impact has been discussed with the Tenant Resource Group (which oversees HRA spending) and OSMC. Neither has objected to the current position, which is especially crucial regarding the Tenant Resource Group as it’s their rental income which would have to fund it (there is no government money available for this as far as can be established). Extending sprinkler coverage would cost millions, which perhaps we could justify if residents were clamouring for us to do it, but that hasn’t been the case and, for the record, I haven’t received a single phone call or email today (Monday) from any council tenant in the city asking about sprinklers, at Redbridge Towers or otherwise. In short, I don’t feel like I’ve ever had a firm mandate from tenants to spend their cash in this way. Q4: In making this decision, did you consult with Hampshire Fire and Rescue Service and who was your contact? A: As mentioned above, HFRS chiefs shaped the proposals jointly with us, so they weren’t just consultees, they worked out the details with us and were in the room all along.